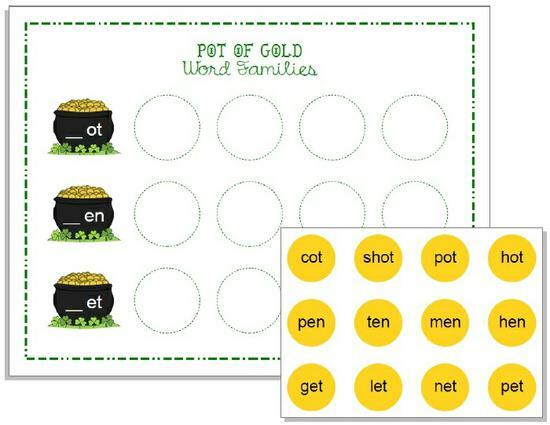 In keeping with the 'pot of gold' theme from yesterday, we found this fun word family activity shared by Michelle of Apples and ABCs. 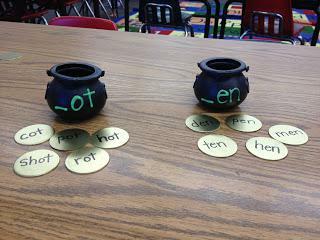 The little pots are just darling and repurposing pogs to look like gold coins is simply genius! Plus, we love the idea of actually sorting, filling, and recording! Of course, with some free clip art and word processing software, this activity can always be adapted to worksheet form as well! See the example below. For the full lesson post and a peek at Michelle's activity recording sheet, be sure to visit Apples and ABCs!ivity can always be adapted to worksheet form as well!